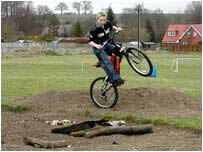 Many young people have been involved with AYC projects and activities since 2006, both elected and non-elected. Some members of the adult and youth committee have won and been nominated for awards recognising their dedication and effort to make things happen. All young volunteers age 16+ can also register with V-Inspire to log all the voluntary hours they spend helping in their community to exchange for official certificates. The Junction charity shop (2012/13) will also provide valuable work experience opportunities and an opportunity for those involved to learn how to manage their own business! Below are a list of the awards that the council and members have won or been nominated for. 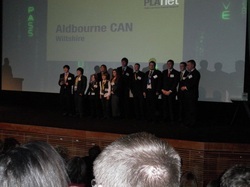 The Inspiring Learning Project Award, sponsored by Lord and Lady Glasbury, was awarded to the Aldbourne Youth Council for transforming their village’s old public toilets into a welcoming Internet café for the community, which they have called “CAN”. 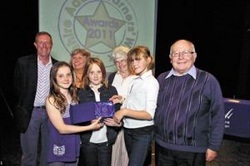 7th December 2010 Aldbourne Youth Council won a Philip Lawrence Award for the Aldbourne CAN project and in particular the 'integenerational' part where young people are assisting older people with developing their IT skills. Won for: Making a difference in the community through their volunteering and involvement with Aldbourne Youth Council and CAN project. Nominated by: 15 nominations! CLICK HERE to read them all! Key Youth Members involved: Adam Wise, Jack Matthews, James Keen, Jon Gibbs, Chris Puttick, Chris Wyatt, Matt Gibbs plus a whole load of others! 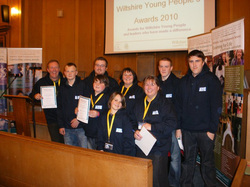 Won for: BMX track and Youth Shelter project plus forming the Aldbourne Youth Council. Below are just a few examples of what we have achieved in our village and what we get up to. Did you know we have raised over £60,000 for our community to help improve it since 2006? This was through applying for grants, fundraising and donations from supporters of our work in our community. Aldbourne CAN fundraising to keep it open and helping with day to day management.